Posted By PA Breast Cancer Coalition on July 16th, 2018 at 2:55 pm | 0 comments. When and how was your breast cancer survivor diagnosed? 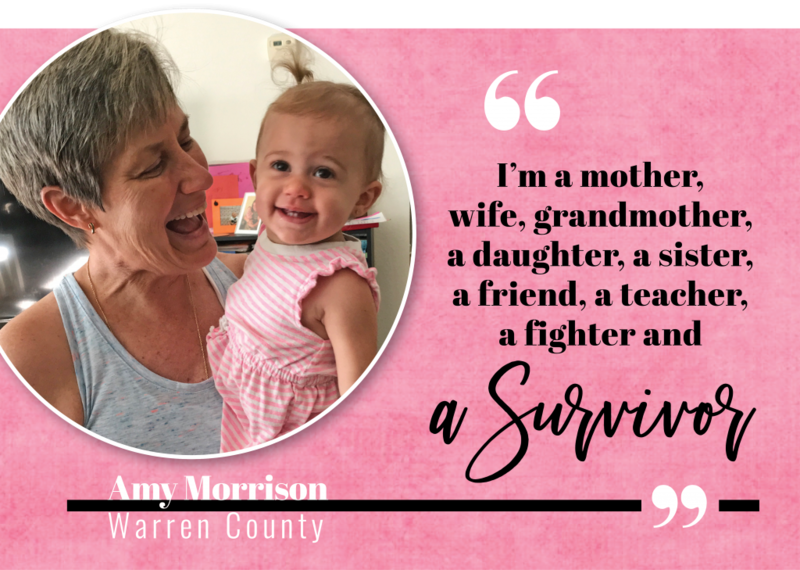 I teach at the Warren Area High School and always have a screening mammogram before the school year begins. 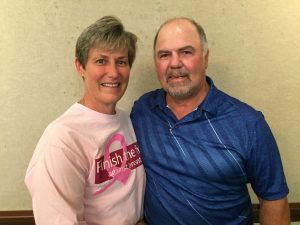 After my August 2015 mammogram I was called back for a follow-up and diagnosed the following month with stage 4 breast cancer. It was breast cancer that had already metastasized to my lymph nodes and liver. Tell us about hearing a diagnosis of metastatic breast cancer. I’m living with it and pray every day but I beat it and I try to keep on beating it. If there’s a recurrence, we’ll deal with it then. Right now I’m cancer free and hope it stays that way. I take an aromatase inhibitor daily but that’s all the treatment at this point. I’m progesterone and estrogen positive and Her-2 negative so I think that helps. I’m metastatic so that means I’m living with it. I’m grateful for all the research that’s going on. I have a friend who passed away eleven years ago and I often think that if the research was as intense then as it is now she might still be alive. Who supported you through your diagnosis and treatment? Number one was my husband Ted. He’s been my rock with all I’ve been through. The whole family has been a strong support. My daughter Megan and her husband Toby have a little daughter Avery who will be 16 months old. She was born when I was going through all this and was my real bright spot. Toby is in the Air Force stationed in Tampa. My son Hank is marrying his college sweetheart in September. He was drafted by the Minnesota Twins in 2016 after college and played two years in the minor leagues. He’s a personal trainer now working with baseball players, doing what he loves. My sister Barbie and I went through Livestrong at the local YMCA and she was my support through that. And I have my parents who are 89 and 85 years old and going strong and living just five minutes away from me. Warren is very small so all my colleagues in the town were supportive. Above all else is my faith. It’s so important. How did you come to know about the PA Breast Cancer Coalition? A woman who taught at our high school is now working at the Warren Public Library. She reached out to me and told me about the traveling photo exhibit, and asked if I would like to speak at the exhibit’s opening reception there at the library. I hadn’t heard of the PBCC before but now I have learned so much about it from reading the website. I love that you’re funding research and creating awareness and making sure that there is always a way for a woman to get a mammogram. Everyone should be able to get a mammogram, to get treatment, and you should be able to go to the best places. Without the PBCC, it seems that many women would not have the chance for early detection with a yearly mammogram. What advice would you offer to someone whose friend or family member has been diagnosed with breast cancer? Don’t allow cancer to define them. I’m a mother, wife, grandmother, daughter, sister, friend, teacher, fighter, and a survivor. I won’t let cancer define who I am.